The roller coaster of Missouri continues as we leave Everton on Monday. Every small creek has a descent and climb; some are so short we launch ourselves down the hill and can make it up the other side without much effort. Some of the descents are so steep that the rider ahead disappears at the middle of the hill! 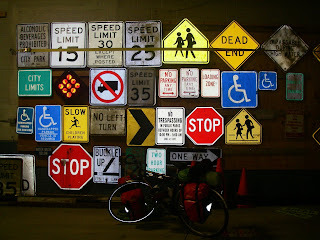 The entire day is spent on county roads which are all named with letters, A, B, C, etc. So we headed east on BB, which became CC and as the day wore on the temperature and humidity increased until we had to stop every 5 miles to rest in the shade. Around 4 pm we reached Fair Grove and decided we were done for the day. We contacted the local historical society and one of the members came and unlocked the bathrooms and showers at the local historical park. At that time, around 5:40 pm, it was 95 degrees and the historical society representative said it had reached 100 degrees on the heat index. The heat index is a combination of the temperature and humidity that reflects the effect on living things like the wind chill factor combining cold temperature and wind. No wonder we had felt so hot! 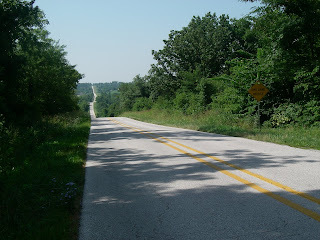 Soon after we entered Missouri (or Missoura as the locals say) we began to notice differences in people and places. Arkansas tuxedos (overalls) are becoming more numerous and Jack Daniels is available at convenience stores. This morning we left Fairgrove on E with a slight headwind (deliciously cool) and cloudy skies. We reached Marshfield in a couple of hours and had lunch. After lunch we came out of the restaurant and the winds were raging. Dark storm clouds were approaching. As we headed out of town, we passed the police station and Belinda thought we ought to check on the weather ahead. Two police officers reviewed the weather conditions and said the storm was heading right to Hartville, today's destination. We took shelter in the shop of the police station as the thunder, lightning, and rain came down. So we checked into a motel and let the weather pass. Hey Michael, yes I think Steve and Diana need a large mouth bass mailbox. Every toney neighborhood should have a few. Actually we have seen several of these in the Ozarks. 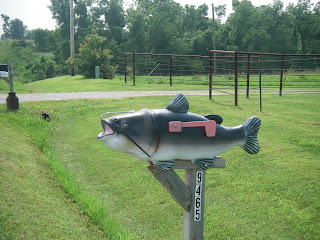 I need say no more..
Well silly me.. this mailbox is actually a catfish, but we have seen several large mouth bass mailboxes as well. I think the cat fish shows more class, hey?